I was taking a shower today, which is where I do my best thinking. I was thinking "Hey, I need to write a new blog post. I wonder what it should be about? There is so much, but I need to narrow it down to something! Whatever it is, I hope it's good. And I really hope I don't write about being in the shower while thinking this." So in my embarrassing moment of pondering, I started to sing It's a Small World. And I realized that I feel like that song is just constantly on a loop in the back of my mind. Then I realized that song is probably on a constant loop in most people's minds. Then I realized that there could be a countless number of people singing this song to themselves! With me! While I was in the shower! Why are all these people in my bathroom?! 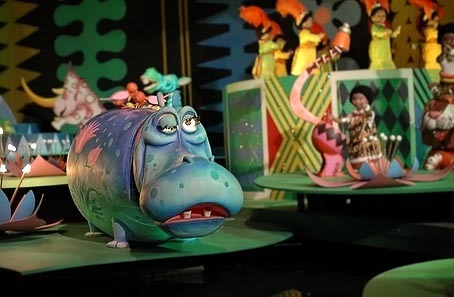 But seriously, the Small World song, written by Richard and Robert Sherman for the 1964 New York World's Fair attraction of the same name, has got to be the most successful song in the world. Not monetary success, but success by the means of recognition. Try to find a person that doesn't know this song. I dare you! I don't think it can be done. In order to do it, you'll probably end up in some South American native village, and even then I bet someone in the tribe would know it. They don't know what a toaster is, but they can sing the Small World song! Bah! He should have to pay them for being so lucky! Okay, maybe not, but if he were going crazy, he should have tried his luck swimming for civilization. The Autopia That Will Never Be.